Check out these fun and creative ways to decorate your fence for the holidays. 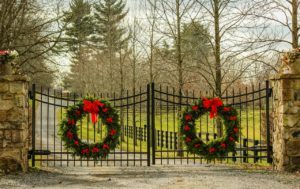 As we enter the holiday season, you may be decorating the outside of your house with lights and the inside with a tree and decor, but what about your fence? Decorating your fence is a great way to show your holiday spirit and add some festive elements to your property! Continue reading for a few creative and fun ways to decorate your fence this holiday season. If you want to keep your yard looking classy, go with the traditional decor pieces for your fence such as green garlands and red ribbons or bows. The green and red decor are perfect are you celebrate Christmas, and adds some holiday cheer to your neighborhood. The bright colors also add a beautiful pop of color to the dark days of winter, and stand out among white snow! If you want your fence to make a statement, decorate with bright lights! When using lights, be sure to run lighting across the fence top, or create loops of lights to showcase the fence surface. Keep it simple with silver and gold lights, or add some color with red, green, or even blue lights. Also, to add some fun, find lights in various shapes such as icicles, angels, or snowflakes. If you desire a rustic theme for your fence decorations, combine green garlands with burlap to make ribbons or bows. Pinecones are also great decor items, along with bunches of berries or holly for a festive touch. Top with a string of twinkle lights, and you’ve got a beautiful fence decoration the neighbors will love! You can either buy decorations or make them yourself with your family for a fun winter night activity. If you want to add a special Christmas element to your fence, add large red, silver and white ornaments to the design. Hang the ornaments on greenery, such as green or white garland, along with sparkly lights to make your fence shine like a Christmas tree. This entry was posted on Wednesday, December 5th, 2018 at 5:45 pm. Both comments and pings are currently closed.